The two largest Italian organizations in the United States, the National Italian American Foundation, NIAF and the Istituto Italiano di Cultura Los Angeles will share the honor of welcoming Italian artist Mario Canali in his first exhibition in the United States at an opening reception and art show at the Downtown Art Center (DAC) Gallery in Los Angeles on February 11. Considered a visionary in contemporary Italian art as well as a forerunner in digital art and virtual reality, this rare glimpse into the work of this icon of the Italian art scene will feature over a dozen of Canali’s oils, pastels and drawings along with two of his most popular interactive installations, Ritmi (rhythms) and Korazone. To accompany the show, Canali has published a hand made, limited edition and signed art book which includes all of the show works as well as nearly 50 others, all printed on recycled paper. Only 100 of these limited edition books will be printed and signed by the artist for this show. All proceeds from the sale of Canali’s art book ($30.00) will go to the Exceptional Children’s Foundation. The Downtown Art Center Gallery is a non-profit gallery supported by the Exceptional Children’s Foundation (ECF). The DAC Gallery opening reception will be held during the Downtown Art Walk on Thursday, February 11, 2010 from 6:30 - 9:30 p.m. 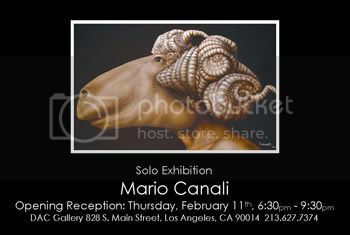 The Canali exhibit will run February 11 - March 4, 2010 at the Downtown Art Center Gallery at 828 S.Main Street in Los Angeles. For more information on the show or Canali’s work, go to www.dacgallery.com or www.studiocanali.com.